Followers of the local Australian Football clubs in the United Kingdom will be well aware of recent turmoil in the game with a second organisation, Aussie Rules UK, starting up senior nine-a-side competitions in 2007. The main controversy has been ARUK not working within the BARFL system (whether it should have is a debate within itself) and deciding to run matches in areas with active BARFL clubs. The result has been small but significant ARUK affiliated leagues starting in Wales, Northern England and Southern England and the loss of several BARFL clubs and effectively the demise of their Regional League. None of this is black and white such as in the case of Sussex which has continued in the BARFL as The Swans but also expanded to support ARUK's southern zone, so there is some cross-over. It's fair to say that if everything was running perfectly in England then ARUK would not have managed to get a foot in the door. Of course it's easy to be critical of the BARFL without truly understanding the hard work done to keep a league running week in week out as a volunteer. 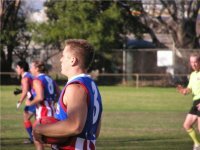 In many respects the BARFL has a proven track record of being one of the most stable and successful Australian Rules leagues around the world, but with a few simmering problems within and pressure from outside through ARUK and the carrot of junior development it seems change could be in the wind. After the tumultuous off season and plenty of frustration by those involved it seems that there might be a mood for a major paradigm shift in the way footy is organised in the United Kingdom. Glen Ocsko, an Englishman who after only a couple of seasons in the game has quickly developed a passion for the sport, has developed a detailed proposal for a way forward. It suggests the UK be split into the five geographic regions London, England North, England South, Wales and Scotland. Each area would have one vote on the over-arching structure put above that, to be called UK Footy. This follows the United States' example of calling themselves USFooty, and they also use the title USAFL, something that the Brits might consider down the track (UKAFL), though critics of the now common AFL branding won't like that thought. The plan faces several hurdles including the requirement that the BARFL dissolves to form a London specific league, and the need for ARUK agreeing to come under the UK Footy banner as well. If the plan gets in-principle agreement the first point of debate could be London getting just the one vote when it remains by far the biggest league in terms of playing numbers. The positives would include the opportunity for a single, recognised body for the sport and the advantages that may bring such as support from Sport England, which is understood to be keen to bring all the parties together (and focussed minds in this direction at a recent meeting of the major actors in this drama). The AFL has been firm that it will support the long recognised BARFL and that ARUK must work with them, something that looked possible once but has been categorically ruled out by ARUK so is no longer realistically a chance. However it seems likely that the AFL would also be pleased to work with a united body for all footy in Britain if the vast majority of clubs can agree on a way forward, i.e. if the BARFL supported the plan too, through their own democratic processes. ARUK will presumably move in the direction given by founder Brian Clarke, and Aussie Rules Wales would most likely follow that lead, though it may have a degree of independence. Sources suggest ARUK will most likely back the plan. And given that the BARFL is a democratically structured body then if this is what the clubs want then presumably it will happen. However we've spoken off the record with parties that would seem to be on opposite sides of the debate, and there are conflicting opinions as to whether the plan has a realistic chance. Theories range from a groundswell of support to a suspicion that it's simply a plan to sideline the BARFL Committee in favour of ARUK and won't get much further. So we may see an end to division or it may simply raise the stakes. There's a conundrum that faces many football clubs, and long term followers of sport will have seen it all before - perhaps the BARFL clubs face a question something like that. It goes something like this. The club has a decent team that has success but not the ultimate breakthrough everyone desires. After a few years dissatisfaction grows - some players feel they haven't been given a fair go, occasional personality battles occur and the fans get restless - they want radical change, fresh ideas, a new coach. So what should the board do? They look at their coach, the players and the combination - is the coach getting the best out of them? Could they or should they have achieved more? Maybe they need change for change's sake to clear the slate, or maybe this is as good as could have been expected. You've seen it all before at various levels of the game, from the AFL down. So there's the club that hangs in there with the same old coach for too long and miss their so called window of opportunity. Then there's the club that makes a sudden change and gets instant results, sometimes leading to ultimate glory and other times drifting back to the status quo. And then the cases where change is made but the club soon finds out they didn't realise when they were on a good thing and subsequently actually slide backwards. So it seems that after 20 years of ups and downs and a variety of tweaks to the system and different personnel, the time has come for the BARFL clubs to decide. Is the current structure the right one? What is holding them back, or is the current status of the game reasonable? Should they be doing much better or has a hard task been done well? It's a tough choice and one that a lot of people that share a strong passion for footy will be agonising over in the coming weeks. There's a lot to happen before the UK Footy plan can proceed and the early reports are mixed, but things are moving fast. It isn't clear what would happen if UK Footy doesn't get up, and a split decision either way may not be healthy, so let's hope the result is emphatic whichever way it goes. A split within the BARFL would just weaken them further and lead to more instability unless the current process reinvigorates the system. We won't pry too much further as the main personnel are best left to make the hard decisions for themselves in the relative privacy of their clubs. Some will see the UK Footy plan as clearly a new way forward. Some will see it as a tool from one side to take control. Given the amount of energy expended off the field recently some may simply decide change needs to happen to stop further wasted efforts. Others may want to take some of the ideas but push them within the current system, something that doesn't seem to have been fully explored. If it does go ahead then the new structure could be in place by late 2007 or early 2008. If not, the current machinations will probably continue. Possibly the plan will bubble along for some time, perhaps with modifications being made to assure sceptics of its good intentions. Good luck to footy in the UK and may the best plan win. And then the real hard work begins - whatever happens the reality is that large numbers of hard working volunteers will continue to be needed to take Aussie Rules in Britain forward.